Bell407 - multipurpose light helicopter. Designed by an American firm Bell Helicopter Textron, as the base of the sample used a helicopter Bell 206 L4 Long Ranger. The first flight of the prototype made 21.04.1994. The first take-off of the pre-production helicopter was 29.06.1995 of the year (CGFOS). The helicopter in 1996 was certified by TCCA and FAA. The first helicopters ordered the company PetroleumHelicopters. It was built before the 1999, more than 300 helicopters. 15.06.2010 was sold the anniversary thousandth helicopter. Bell 407 has a four-bladed bearing rotor designed for OH58D (Model406). Sleeve and blades without assigned resource are made of composite material and provide the best in comparison with previous models comfort and other flight characteristics. Vibration-isolating means are used in the design of the main-rotor pylon; similar means are introduced into the skid landing gear scheme to eliminate the resonance near the ground. Compared to the Bell 206, the 407 fuselage is wider by 18 centimeters, which increases the cabin volume. Glazing area is larger by 35 percent. The helicopter is equipped with a Rolls Royce / Allison 250 C47 turboshaft engine: take-off power 813l.s. (606kW. ), The longest continuous power of 700l.s. (522kW.). The engine is equipped with a single-channel FADEC type electronic control system. Common stock 477l fuel; in the luggage compartment rear optional extra tank can be placed with a capacity 75l. The engine provides the greatest improvement in take-off weight and the properties at high altitudes and at high temperatures. Glider 407 generally similar in appearance to LongRanger, but it differs from the tail boom, and which is made of carbon fiber. In a typical configuration, the helicopter room for five passengers and two crew members. Bell in the 1995 year tested the tail rotor, which is enclosed in a ring, but this idea was later abandoned. Bell engineers also investigated the possibility of installing two engines on the Bell 407, but instead decided to design a completely new twin-engine helicopter called the Bell 27. He received as the power plant two PW206D Pratt & WhitneyCanada engines. The Bell 407 helicopter brought great popularity around the world record flight, its route passed through the North and South Poles of the Earth. A car with two crew members on board took off from the airport of Fort Worth (Texas) 5.12.2006 of the year and returned back to 23.03.2007 of the year. Over 189 days, more than 57900 km was overcome, a couple of dozen landings were made, even at the North and South Poles. Net flight time was 300 hours. ARH70 .- military version Bell407, attack reconnaissance helicopter. 4 prototype released. Bell417 .- A larger version of Bell407, the civilian version of ARH70. Bell407LightObservationHelicopter .A reconnaissance military helicopter. Eagle407HP .- Version with more powerful 1033l.s motor. (760kW.). Bell407AH .- Civilian version, adapted for mounting weapons, infrared camera systems and night vision. 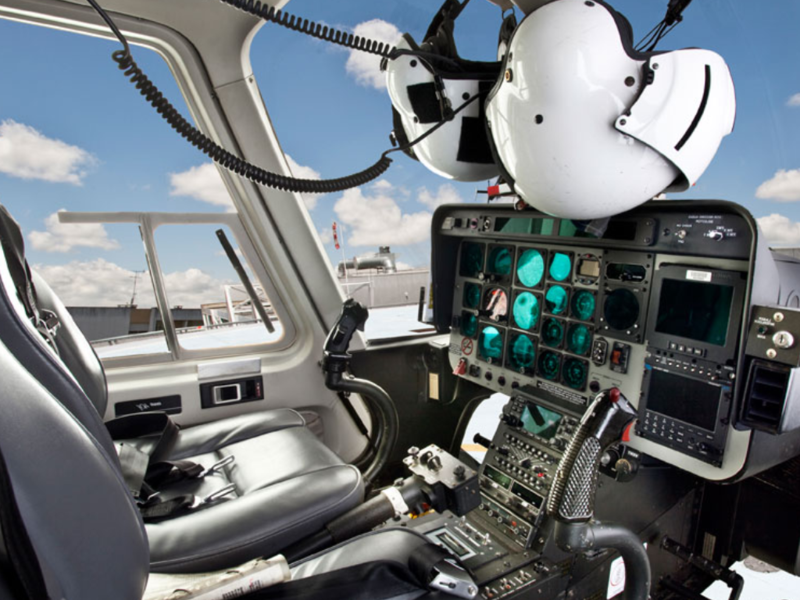 Bell407GX .- Version with synthetic vision system and instrument panel GarminG1000H. Seating capacity: up to 6passazhirov. The diameter of the rotor: 10,67m. The diameter of the tail rotor: 1,65m. Fuselage Width: 2,29m. (For runners). The area, which swept rotor: 89,38 sq.m. The highest take-off weight: 2381kg. with suspension: 2 721 kg. The volume of fuel tanks: 484l (+ 72l luggage). Engines: 1 × turboshaft RollsRoyce250C47B. Link: 1 × 760l.s. (1 × 606kVt. (Takeoff)). Maximum allowable speed: 259km / h.
The duration of the flight: 3chasa42min. Rate of climb:. 6,8m / s.
The load on the drive: 27,9kg. / Sq. Thrust-to-weight ratio: 221Vt / kg. (on the transmission at normal takeoff weight). Width of cargo cabin: 1,37m. The height of the cargo compartment: 1,0m. at the ground: 246km / h.
at an altitude of 1220m . : 250km / h.
at the ground: 207km / h.
at height 1220 213km . : m / h.
without the use of ground effect: 3170m. Timm Collegiate. Specifications. A photo.